The Derg was established in June 1974 as the Coordinating Committee of the Armed Forces, Police and Territorial Army by low-ranking officers of the Ethiopian Army and police led by Chairman Aman Andom. The Derg was formally renamed the Provisional Military Administrative Council and in September 1974 overthrew the government of the Ethiopian Empire and Emperor Haile Selassie during mass protests. The Derg abolished the monarchy and embraced communism as an ideology, establishing Ethiopia as a Marxist-Leninist one-party state with itself as the vanguard party in a provisional government. 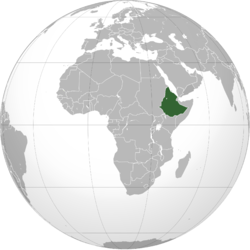 The abolition of feudalism, increased literacy, nationalization, and sweeping land reform including the resettlement and villagization from the Ethiopian Highlands became priorities. Mengistu Haile Mariam became Chairman in 1977, launching the Qey Shibir to eliminate political opponents, with tens of thousands imprisoned and executed without trial. This article incorporates public domain material from the Library of Congress document: Edmond J. Keller (1991). Thomas P. Ofcansky and LaVerle Berry (ed.). "Ethiopia: A country study". Federal Research Division. The 1987 Constitution.